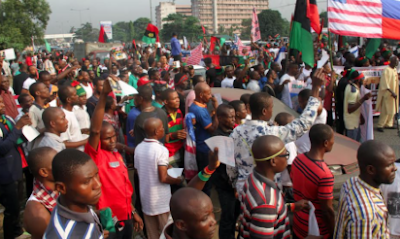 THE South-East Senate caucus, yesterday, condemned the alleged killing of unarmed members of Indigenous People of Biafra, IPOB, said to be holding a pro-Trump rally in Port Harcourt, Rivers State by members of security agencies. The South-East Senators have also called on the Federal Government to carry out a holistic investigation into the allegations of deliberate application of excessive force by security agencies in the containment of peaceful assembly, particularly when groups from the South East are involved, with particular reference to the latest action. In a statement in Abuja, weekend, Chairman of the South East Caucus, Senator Enyinnaya Abaribe noted that security agencies applying excessive force in a peaceful rally was reprehensible and questioned what the Senators called an emerging pattern in the containment of peaceful assembly in Nigeria. Abaribe, who noted that the 1999 Constitution of the Federal Republic of Nigeria as amended provides for the freedom of association and the right of the people to freely assemble to express their common interest, said: “The last time I checked, that section of the constitution is still intact and has not been amended. It is therefore worrisome that the rights of a section of Nigerians would be so wilfully denied with such extra force. “If the report of killings by the security agencies were to be confirmed, it would no doubt leave a gaping hole in the unity of this country. This is one regrettable action too many, coming against the backdrop of the recent report of the Amnesty International, AI, of mass killings of people from the same section of the populace in Nigeria. Also, presidential candidate of the United Progressive Party, UPP, in the 2015 election, Chief Chekwas Okorie, has condemned the alleged killings. In a statement he signed in Abuja, weekend, entitled, “The Port Harcourt massacre: Nigeria cannot continue this way,” Okorie urged President Muhammadu Buhari’s APC-led administration to take urgent steps to investigate all the unwarranted killings of Igbo men and women from the inception of his administration, prosecute all those found culpable and compensate the families and relations of the victims. “MASSOB condemned the brutalization and unwarranted killings of Biafran agitators in solidarity march for US President Trump at Port Harcourt. “Clampdowns, imprisonments, persecutions, extra judicial killings of Biafra agitators by Nigeria security agents will never deter us. Our oppressors with their oppressive actions against us increase the self determination spirit and consciousness of Biafra.” Denial by Police, Army height of cowardice Similarly, the Indigenous People of Biafra, IPOB, worldwide has described as an act of cowardice, the frequent denials by the Nigerian security agents, each time they kill non violent Biafra restoration agitators. IPOB in a statement by its Media and Publicity Secretary Mr. Emma Powerful, said: “We find it distasteful that Nigerian Government and her security agencies, notably the army and police, have the temerity to deny their involvement in the killings, maimings and illegal detention of our family members following the IPOB /Trump solidarity rally on the 20th of January 2017. “It has become routine for Police and Army in Nigeria to kill, bury and lie. They deny every mass killing they carry out in Nigeria with the help of certain segments of some local media. That is cowardice at its greatest height. If they are right in what they are doing, why are they denying.